There we are, the bikes packed and all our friends and family around us. It feels strange to leave for such a long time. This way you really find out what you have and will miss here. Friends, family and colleagues. Thank you all for the reactions, postcards and best wishes! The first few days we cannot really get used to the idea. It feels like we are going back home soon. There is still such a long way ahead and it feels unreal. After a few days it get’s better and we get used to this way of life. This allows us to enjoy cycling and traveling every day a bit more. 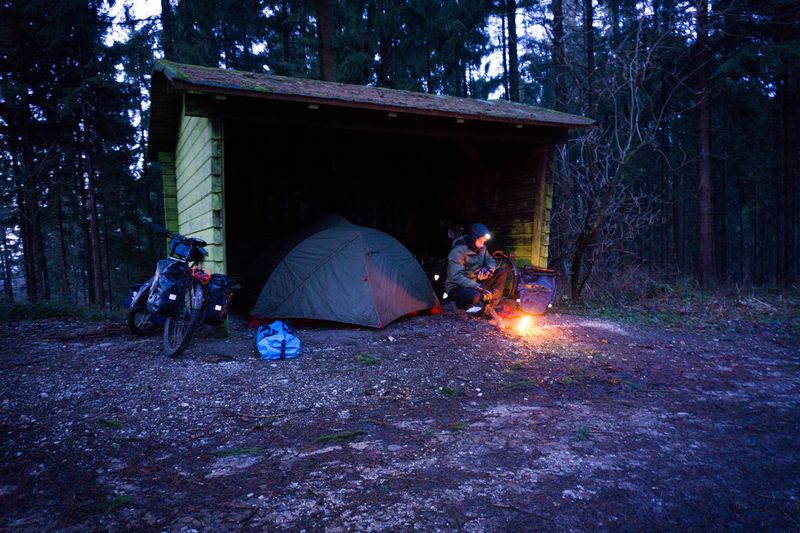 On the third day we went wild camping. Lynn had figured out in advance where we could possibly place our tent, places with shelters, so that we could have some extra warmth and we could cook in a dry place. The first night we were already put to the test. The shelter was on top of a mountain with only a narrow (muddy) path to get there. We had to push the bikes in the pouring rain. We were tired. Yet, we had to move on and once we arrived in the dark, we could place the tent dry and out of the wind inside the shelter. We cooked a meal on our stove. Usually we go to sleep between 8 or 9 in the evening, because it’s too cold to sit outside. Wild camping is quite exciting. Certainly in the beginning you wake up at every sound and you think someone is coming. That’s why we put up the tent only when it’s dark and break up before sunrise. The cycling is becomes easier day by day. We notice that we become a bit stronger. 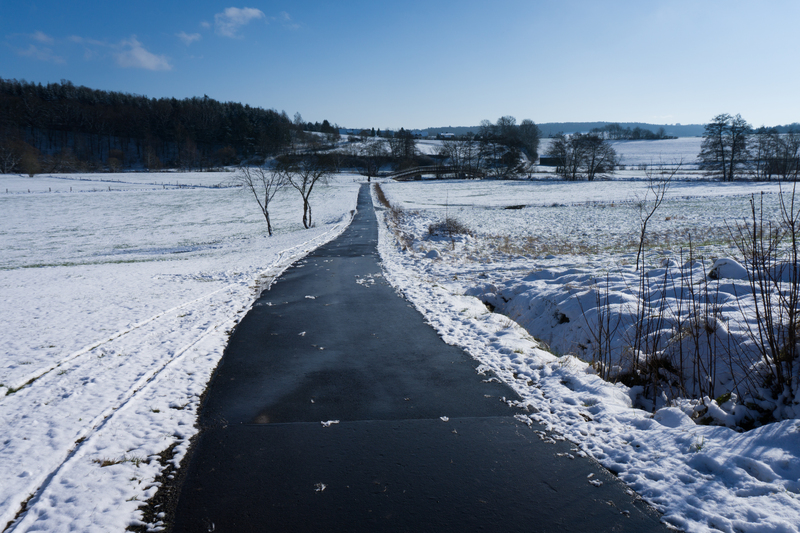 Although there is more snow on the paths and we have cold feet. Sometimes we walk or run a bit to warm up. After a break it takes us half an hour to get our body temperature back to normal. The surroundings are also becoming more beautiful and we come across more hills and mountains. 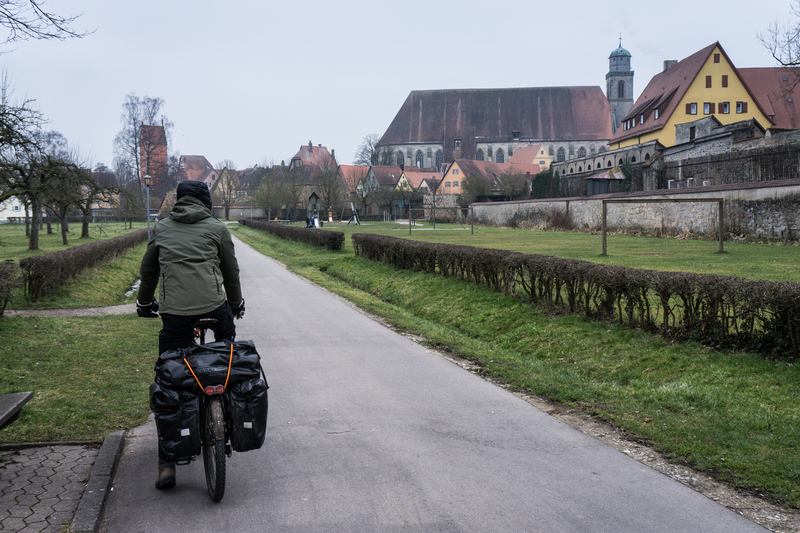 We mainly cycle along cycle-paths or quiet roads without traffic, past small villages with old timbered houses. 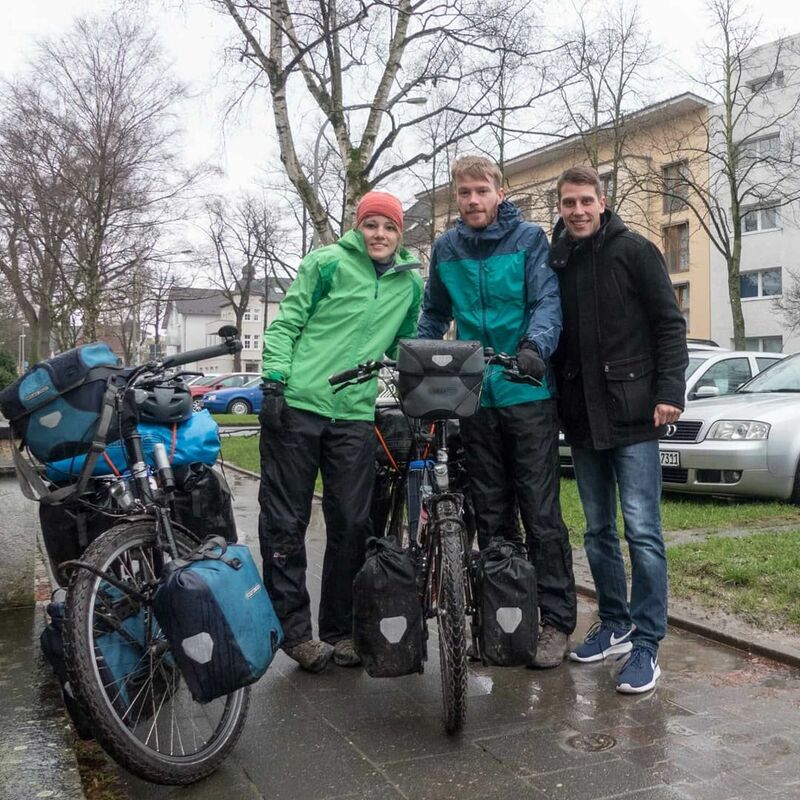 We have cycled about 1200 kilometers through Germany. Mostly we could follow the D-Route 9, so we did not have to use our GPS app on our smartphone all the time. The D-Route 9 consists of the Fulda-Radweg (R1), the Rhön-Sinntal-Radweg, the Main-Radweg and the Romantische Straße. From Augsburg we deviated from the route to Munich and then we followed Via Julia to Salzburg. The route was very nice, quiet (not so special in February 😉) and well signposted, but not always snow-free. 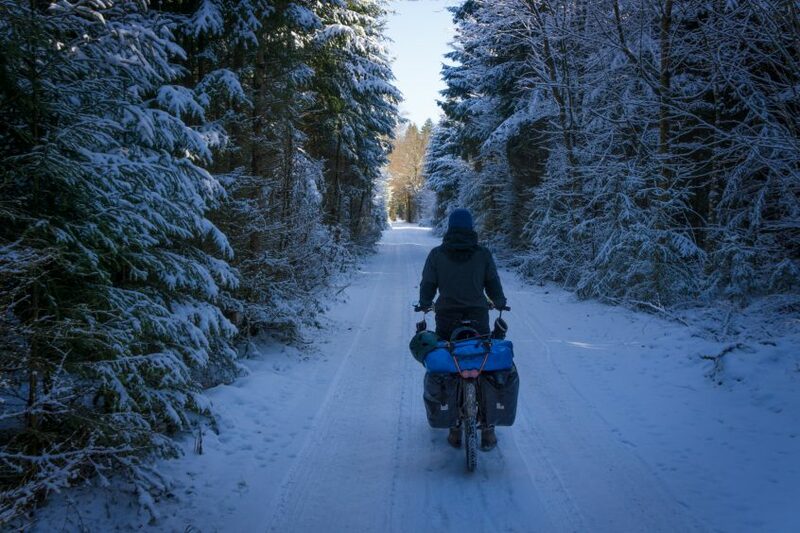 On the way we received many questions from people, why we started our bike tour in winter. In the end, it wasn’t so bad. We only had rain on 2 out of the 18 days! It was cold but sunny and we were able to enjoy beautiful winter landscapes. The reason why we started so early is that we have more time to cycle to (and through) Central Asia. There it can be winter in October. We also hope for nice weather along the Adriatic coast.. But first we look forward to Austria, the Alps and the snow. We have no idea whether the paths will be easily accessible and whether we can handle the altimeters with our luggage. From Salzburg we will cycle two days up to Böckstein (near Bad Gastein), at 1,100 meters altitude. From there we take a train for 10 minutes through a tunnel to the other side of the Alps. We used Warmshowers for the first time. 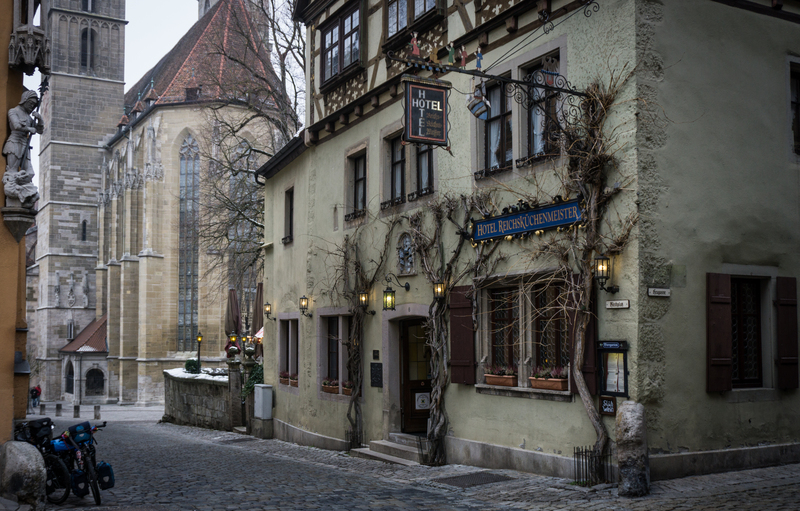 In the end this turned out to be the highlight of our trip through Germany. All hosts were unbelievably hospitable. It’s also very nice to have a look inside people’s homes, instead of just cycling past the houses. 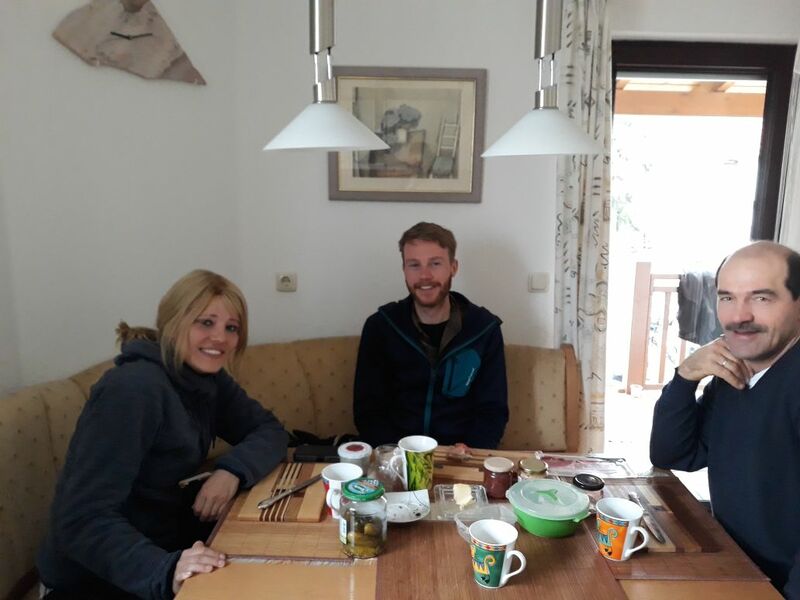 One night we stayed with Cederic, a student from Paderborn. He showed us the city and had dinner together. He himself went to sleep with a friend so we could sleep in his room, very special! 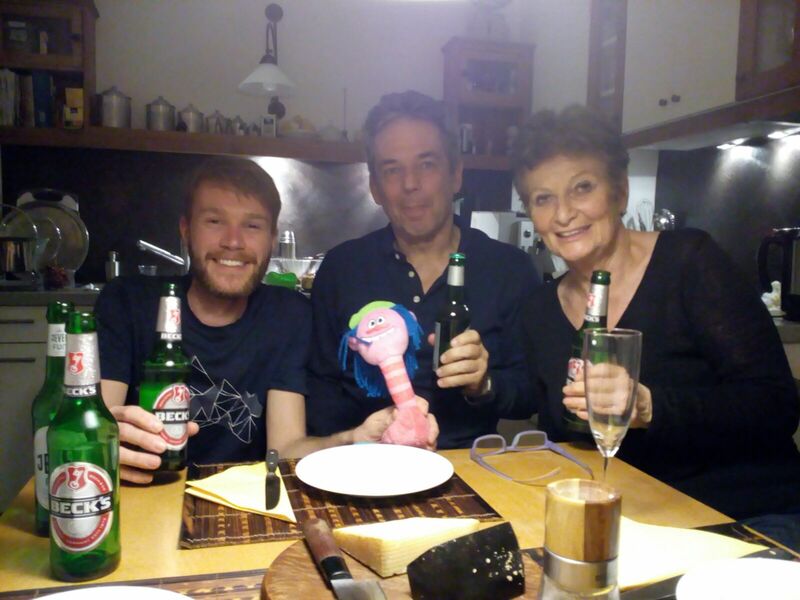 We have been able to meet many different people in Germany. This way every stay was a unique experience. 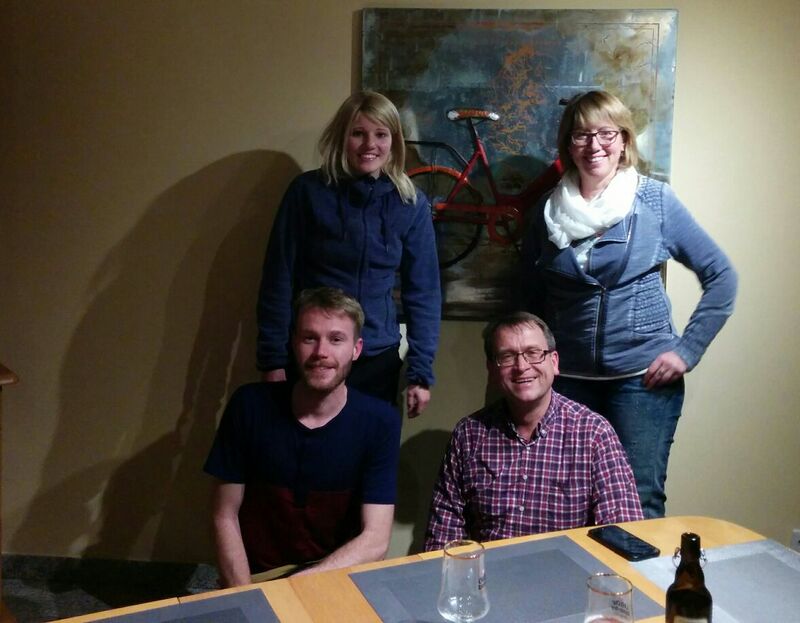 It gives us extra motivation to continue our journey, after hearing so many great cycling and travel stories. Thank you all! 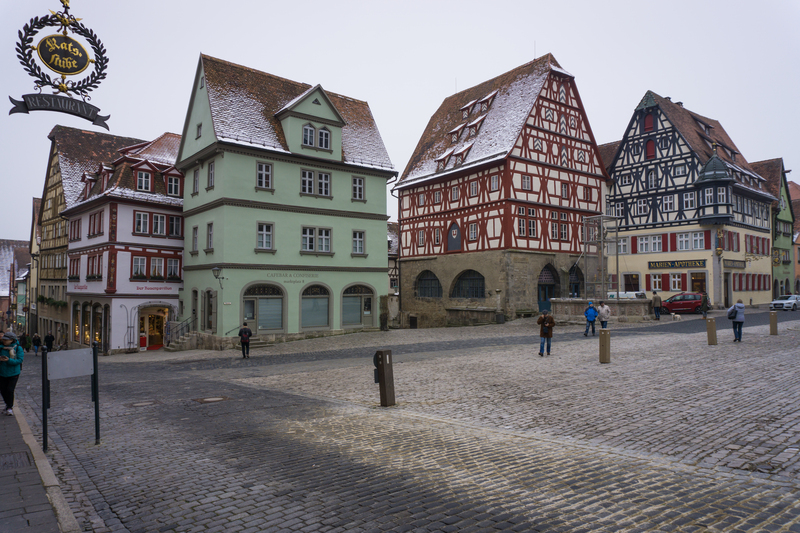 THE LAST DAY IN GERMANY? Today we are going to Austria (Salzburg). We have a long ride ahead (about 95 kilometers), so we want to leave early. When I (Robert) want to hang the bags on my bike, I find out that my brake pads are completely gone and scratched a bit into my rims. Ah, that’s why we heard that cracking sound yesterday. Fortunately, Harald, our Warmshowers host in Rosenheim, had some spare brake pads and together we replaced them. Then Harald saw that there was a small warp in my back wheel. Fortunately he has experience with this and he makes the wheel straight again. Later as planned, but we are on our way. We are going to Austria! 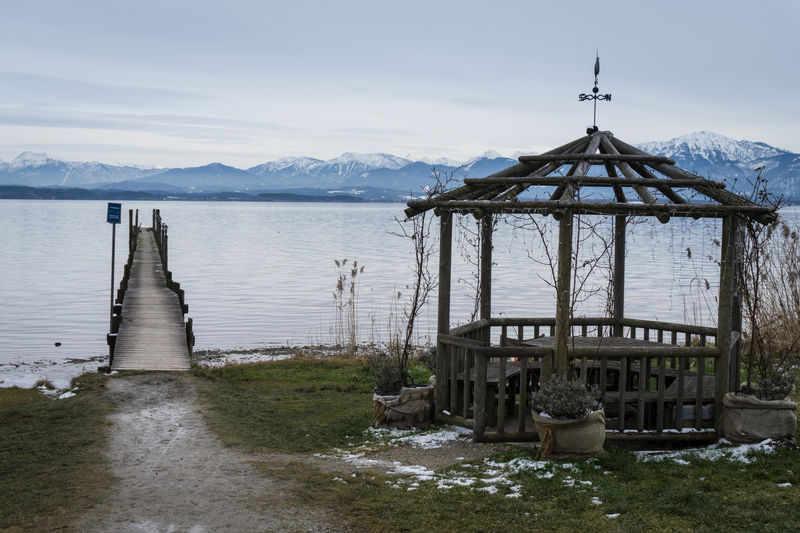 We cycle along the Simssee and Chiemsee, two large lakes with the Alps in the background. Really beautiful. We stop a lot to take pictures. Then it starts to snow and it got dark slowly. It will be a long day. But we don’t have any food left, so we decided that we should go on. Suddenly a car stopped next to us and the woman asks: “Can I help you?”, “No thanks, we are going to Salzburg.” “Today?! “, “Yes, no problem.’’ we both say. We trudge on, in the dark and it’s still snowing. One hour later we are discussing along the side of the road whether this is sensible. A car stops again, with that same woman. She says: ”There is a train station nearby, or you can stay with me”. We decide to go along. The next day we cycled into Salzburg after 20 kilometers.